Açores - Azores - São Miguel - Furnas, originally uploaded by Luis Miguens. The green of the tree-lined avenue of plane-trees with its blue hydrangeas are the best invitation to enter and visit the Casa do Monte (House of the Mountain).You'll be able to usufruct the beautiful garden's nock, explore walking trails through a beautiful countryside, bicycle riding, horse back riding, to play croquet, swimming in the crystal clear waters of Baía das Capelas, to visit interesting tourist places around and playing golf in the Campo da Batalha (Batalha's golf course). 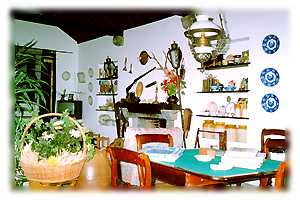 The Casa do Monte is situated in an agricultural property, a family property for three centuries, with unusual typical features, offering a variety of agricultural activities. If you like to be in contact with the nature and animals, it's a goog place to visit. 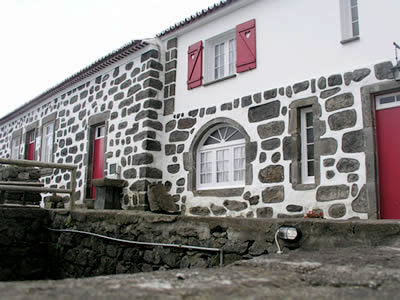 The Casa do Monte is decorated in a tipical azorean style and has five bedrooms with private bathroom, a cozy living-room with fire place and a solarium terrace with a break taking panoramic view of the moutains and the island's north coast sea.The brekfast (homemade) is served in a traditional Azorian kitchen, in a calm and relaxed environment that brings the nostalgy of the past. It also has a beautiful XVII century style dining-room. The Godmother's house is a "treat" right at the Vila do Nordeste. Two cosy houses to choose from right at the entrance of one the most beautifull villages in the Azores and a third house in the centre of the vila give a warm welcome to thoso who decide to stay around for a few days. It is the ideal place for those who want far and close to everything. Northeast offers to its visitants landscapes, crystal clear waters and an absolute sense of peace to who ever intends to rest. Everybody who visit this village is suprised and amazed with its exuberant beauty promissing to come back. Godmothers House enterprise, is located in the extreme north of the island of S. Miguel, in the vilige of Nordeste, one of the most flowery places of Portugal. This village, iss bessed with pretty sight spots and leisure zones in touch with nature, where people are used to enjoy meals in the fresh air, mainly barbecues. It is in this part of the island, that it is possible to enjoy the beauty of sunrise. Situated in the heart of the village of Nordeste, our houses are 2 minutes walk from every main building: health center, restaurants, mini-markets, shops, church, City Hall, post office and pharmacy. Five minutes by car to get to the natural swimming pool of the "Boca da Ribeira" and ten minutos by car to the beach of "Lombo Gordo" as well to the viewspots of "Ponta do Sossego" and "Ponta da Madrugada". 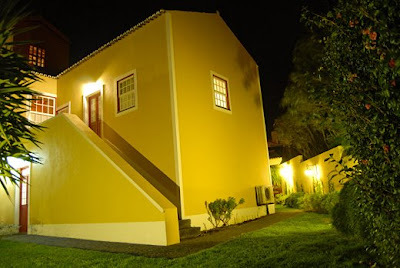 Casa da Japoneira is located near the sea, on the southern coast of Faial Island and its origin goes back to a two floors house with well, built in the 19 th century. The singularity, the architectural and cultural interest of this rural house, justified its inclusion in Horta’s Heritage Inventory. 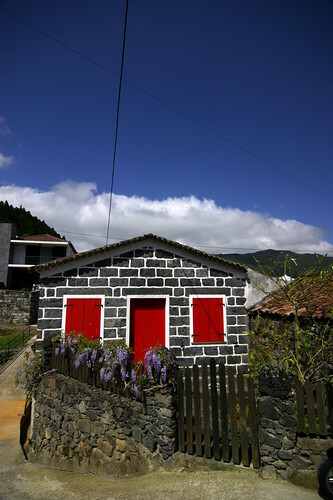 This small Rural Tourism unit is the best way of travelling into the Azorean culture and traditions. During the house’s recovery works there was the concern to maintain the original architectural traces and, at the same time, adapt it to the modern demands of comfort. Therefore were projected double rooms and twins with toilet, reading and living rooms. Air-conditioning, cable TV, telephone and wireless Internet were installed. In the exterior there are balconies with panoramic views to the neighbour island Pico and areas of entertainment in a garden of about 1000m2, where the camellias are the predominant trees. Casa da Japoneira puts at your service fishing material, as the house is located very near to the Lajinha bathing areas, a privileged place for fishing or sea bathing. There is also the possibility of making walking and biking tours and, with previous booking, tours on the island with official national guide. 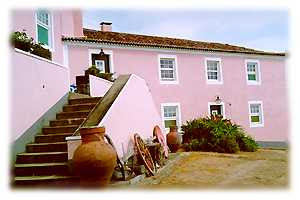 Casa da Japoneira is located on the planes of the parish of Feteira, 5 km to the west of the town of Horta and 6 km to the east of the airport. Departing from Horta, in a 15 min. boat trip, you can visit Pico Island, if the Azores High allows it, and climb to Portugal’s highest point. 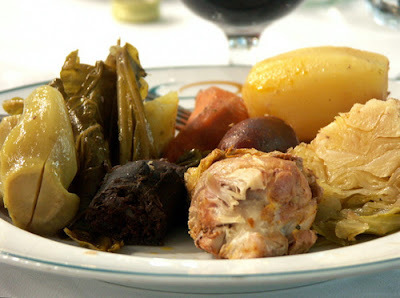 Besides the meat and fish recipes that can be said to be "Azorean", since they can be found all over the archipelago, Flores also offers such local specialities as watercress soup, boiled pork with vegetables, tripe, yams with tasty sausages, beans with pigs head and pasteis de ervas marinhas. The tasty cheese produced on the island, the soft creamy butter, and the delicious honey which has the scent of flowers always present on Flores throughout the year, complement the meals. Not forgetting of course the crabs, goose barnacles and limpets found on the rocks washed by the sea.